Caithness Model Club handed over a cheque for £500 to Caithness Health Action Team (CHAT) at the first day of their annual model exhibition in the Norseman Hotel, Wick today. Chairman of CHAT Bill Fernie and committee member Liz More accepted the donation on behalf of CHAT. 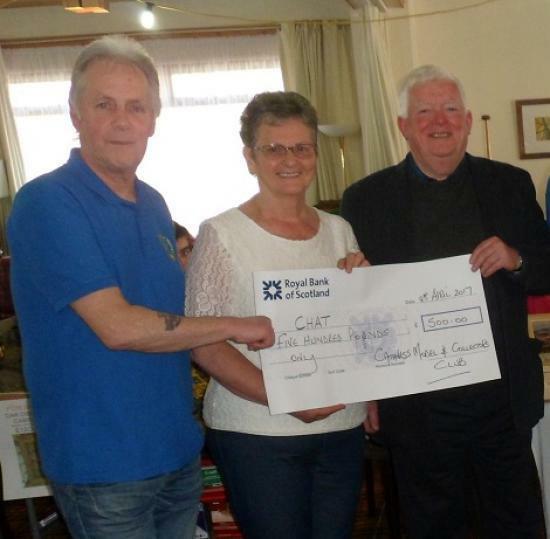 Bill thanked the Model Club for their generous donation and for showing support for the CHAT campaign to retain health services in Caithness. Bill added, "The growing community support is being seen in the fact that more and more individuals, businesses and community groups are joining CHAT to protest at the reductions to our health services in the far north. Despite the moves to reduce services that do not seem to be at an end CHAT will begin to focus its attention more on what Scottish Government is or is not doing to help us retain our services that are regarded as very important by everyone. A few of us went to Edinburgh to deliver a petition signed by over 6000 people and we will go back as often as it takes to draw attention to what is happening." The Model Club donation is the second large donation in less than a week with Wick Community Council handed handed over £1000 on Monday night.